Last Sunday May 6th was Bike Habitat‘s Tour of Carson, an annual event that this year celebrates the shop’s 5th anniversary in business! The Tour of Carson began in 2008 as a way for the shop to say thank you to its customers and the community for their support. 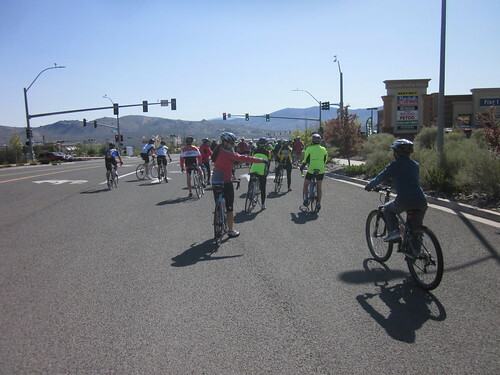 The event begins with a 27-30 mile ride around the perimeter of Carson City, and then finishes back at the Bike Habitat for a BBQ. The number of riders participating in the Tour of Carson has grown steadily each year. Back in 2008, probably no more than 20 people attended, and it was easy to seat everyone for the BBQ in a small clearing in the middle of the shop. 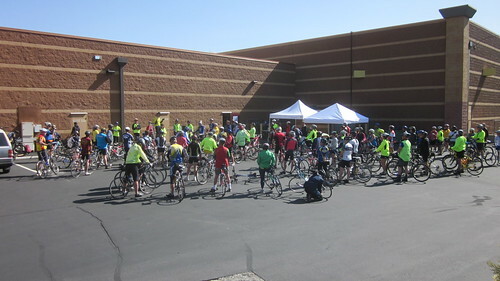 I think everyone was a little surprised this year when over 80 people showed up to ride! My first thoughts were, “Man, I hope Denis and Viola brought enough food…”. As many people as there were, the sign-ins went pretty smoothly. 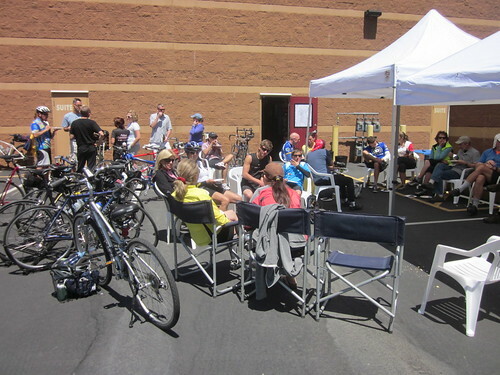 We also assembled in the back of the shop, which helped corral all the riders for the pre-ride instructions. We were honored this year to have Mayor Bob Crowell ride with us. The Mayor, also on the Regional Transportation Committee, is a big advocate for cycling in Carson City. 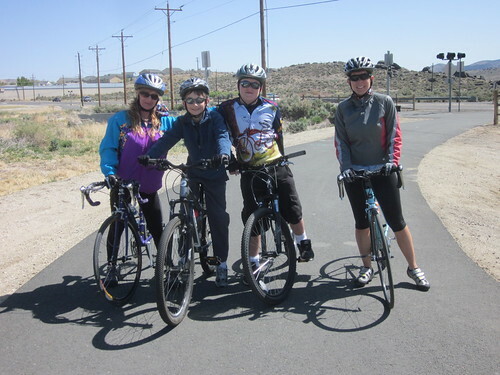 He has helped with projects like getting bike lanes on Roop Street, the application to become an official Bicycle Friendly Community, and getting more recreational trails in and around Carson City. This was his first Tour of Carson, and he remarked that he didn’t realize Carson had so many hills! My personal experience on the tour this year was a little different than on previous rides. 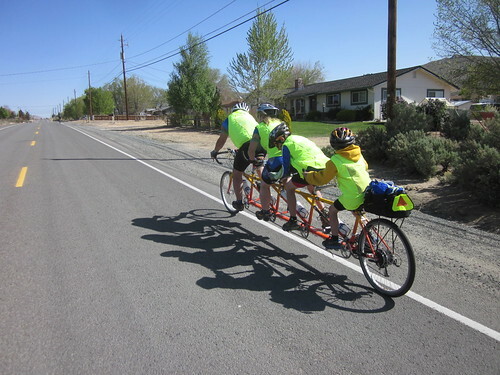 In recent years, I’ve done the whole ride with my son on the back of a tandem. He’s older now though, and he’s gotten to the point where he wants to ride his own bike. I knew the entire loop would be too much for him, so we came up with an alternative 15 mile loop that was still challenging, but also a lot of fun. He even got to bring along a buddy. Early in the ride, the route takes you north along Edmonds Drive. This section has the most traffic of the ride, and there isn’t much of a shoulder. It’s a good place to gauge the awareness of Nevada’s new 3-Foot passing rule. For the most part, people seem to get it. There were only a few motorists that buzzed us, even when the other lane was empty. The other challenge on Edmonds Drive was the cold headwind from the north. It had no intentions of letting up, and made me glad I dressed on the warm side. When we got to the 5th Street Round-a-bout, it was time for us to deviate from the official course. 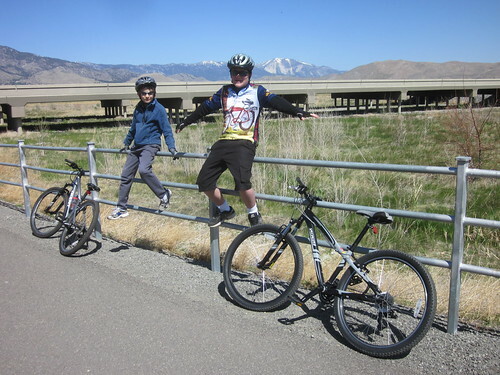 Instead of heading out Carson River Road to the East, we jumped on the Linear Multi-Use path and headed west. We were all happy to get out of the wind and traffic, and it was a very relaxing part of the ride. As the path passed under the freeway, the roar of the traffic diminished behind us, and was replaced with the sounds of birds and other wildlife in the wetlands. The Red-Winged Blackbirds were quite numerous on this day, and they zipped and sang as they flew about the reeds. 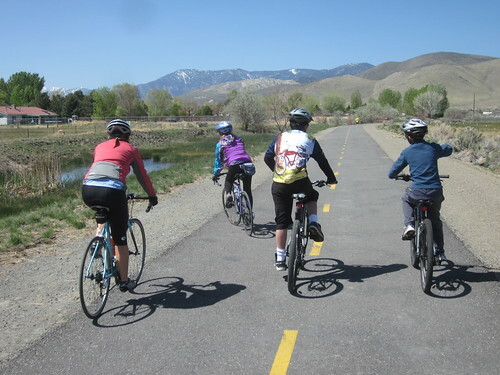 The Linear Path is a great asset to Carson City, and is the perfect model for future paths to further connect cyclists to where they need to go. After finishing the Linear Path at Governors Field, we made our way over to Curry Street just south of the dangerous narrow hillside section. From this point, all the way down to Koontz, we enjoyed a peaceful ride with the wind at our backs, riding on wide bike lanes. 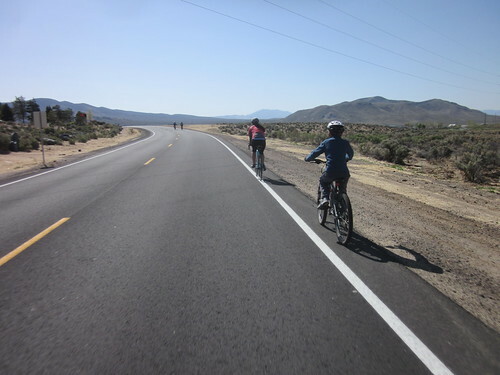 After a short time back on the east side of HWY 395, we crossed back over at Clear Creek Road, and then up the steep hill of Vista Grande Blvd for the final stretch back to the Bike Habitat. Our timing was great, and we arrived at the BBQ just as the faster riders were getting done with their full 30 mile loops. For the next hour or so, we relaxed out back with some delicious food, caught up with friends, and even made a few new ones! Thank you Bike Habitat for putting on such a fun and well attended event, and congratulations on your 5th anniversary! Next Next post: Bike to Work Week Begins!